The long-term growth perspective or potential for India is one of the highest in the Asia Pacific region. India will remain one of the strongest growth stories in the Asia Pacific region as the country has a potential GDP growth rate of around 6-7 per cent or perhaps even more, global finances services major Goldman Sachs has said. Timothy Moe, the chief Asia Pacific regional equity strategist at Goldman Sachs Research views the current cyclical recovery coupled with improvements in the ease of doing business, that have largely flown "beneath the radar", as positive signs for India's long-term growth and corporate earnings environment. "The long-term growth perspective or potential for India is one of the highest in the Asia Pacific region. India has a potential GDP growth rate of between 6-7 per cent or perhaps even more," Moe said. Lots of practical reforms have taken place and they are broadly facilitating the macro growth and should ultimately also translate into a better corporate earnings environment, he said. "The long-term positive drivers are the five year very strong growth potential and the fact that we have got a cyclical recovery in the economy, and what appears to us to be is the beginning of a cyclical upturn in profits," Moe said. The aggregate top line GDP growth is strong and basically driven by very favourable demographics and low per capita income which allows more rapid growth as you catch up staring from a low base, he added. "From a cyclical stand point, we think the economy is also on the upward trajectory and that is helped by a more accommodative central bank," he said adding interest rates have been coming down, inflation rate is coming down and this is filtering down to corporate earnings cycle - the key thing driving markets. On reforms, he said its impact has so far been a mixed bag - "a glass half-empty, half-full". The empty part, is that some of the larger headline reforms like the Goods and Services Tax that have not yet been passed because of domestic political hurdles, Moe said. There have been quite a lot of micro level reforms, the ease of doing business has improved dramatically, he added. Indian economy is projected to expand by 7.6 per cent in 2016-17 and accelerate to 7.8 per cent in 2017-18, mainly on the back of domestic consumption demand aided by steady employment and a relatively low inflation, a UN report for the Asia-Pacific said on Thursday. "The near-term growth outlook is positive, with the projected growth being 7.6 per cent in 2016 and 7.8 per cent in 2017," said the United Nations Economic and Social Survey for Asia and the Pacific-2016 report. The urban household spending is expected to drive the momentum amid steady employment growth and relatively low inflation, the report stated. Fixed investment conditions are seen to be improving because of lower borrowing costs and a more enabling business environment brought about by a better World Bank ranking on ease of doing business. However, the UNESCAP report pointed to challenges such as high levels of stressed assets in the banking sector and a fragile business confidence that could constrain investment growth. It linked the overall strength of domestic demand to progress made in implementing structural reforms and how rapidly large-scale stalled infrastructure projects are unlocked. "Some progress has been made in reforming the fiscal policy such as the rationalisation of fuel price subsidies, but implementation of the Goods and Services Tax remains an important reform that is being held up due to political deadlock," said the report. According to Rathin Roy, Director, National Institute of Public Finance and Policy under the Finance Ministry, who was present, democratic and social deficit are preventing India from looking beyond 7.5-7.8 per cent. "Democratic deficit and social deficit are preventing India from looking beyond 7.5-7.8 per cent. I will be happy with 7.4 per cent. When we all know that we are not going down to 6 per cent, that is a good news, but we are not going to go up to 9 per cent," Roy said. "Our supply side is short, we have huge challenges on the infrastructure side and project execution." On the export front, he felt that socio-economic conflicts are proving to be a big drag. According to Nagesh Kumar, Head, ESCAP South and South-West Asia, India can grow at a much better rate if issues related to gender inequality are addressed and women have equal participation in the economy. Ratings firm Ind-Ra on Monday revised downwards to 7.7 per cent India's GDP growth forecast for the current financial year, from 7.9 per cent earlier, due to weak industrial growth. "Despite favourable prospects for agriculture due to an above normal monsoon, industrial recovery is proving to be a drag on the FY17 growth prospect," India Ratings and Research (Ind-Ra) said in a report. 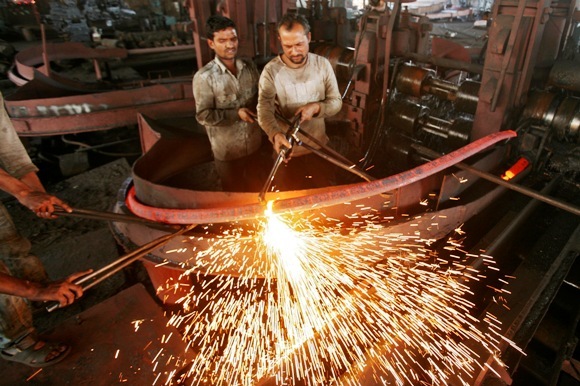 Recovery continues to be fragile and this is getting reflected in the monthly Index of Industrial Production data, it said, adding that IIP in 2015-16 fiscal, till February, has grown by just 2.6 per cent. It said: "While the government's initiatives such as 'Make in India', 'Digital India', 'Start Up India, Stand Up India' and 'Ease of Doing Business' have created buzz and projected India as an important destination for manufacturing activity, it will take a while before they translate on the ground." India Meteorological Department (IMD) had predicted that there are 94 per cent chances of country receiving "normal to above normal" rainfall, while there is only 1 per cent probability of "deficient" rainfall this year. Resilience of the country's agriculture has increased over the years, and it no longer witnesses a sharp decline in output and gross value added (GVA) in the years of a sub-par monsoon, Ind-Ra said. As the downside to agriculture has reduced due to a sub-par monsoon so has the upside to agriculture with a favourable monsoon, it said. It said private investment is still down and out due to lack of demand, suboptimal capacity utilisation and cheap imports in select cases. The last fiscal witnessed some traction in urban demand. With a favourable monsoon rural demand will gradually pick up. "A sustained decline in inflation and monetary easing would help consumption demand to revive further in FY17," it added. The report expects inflation based on the Wholesale Price Index (WPI), which has been in the negative zone for 17 months, to turn positive in early 2016-17 and be beneficial for both government and corporates. The recovery of Indian economy is very much on track in key sectors and factors like favourable monsoons and additional spending by way of pay commission awards may add to this recovery, says a Nomura report. According to the Japanese financial services major, the magnitude and breadth of recovery across sectors is "surprisingly strong". "In our view, the recovery is very much on track and evidence is now getting stronger that a synchronous recovery is now on the way," Nomura said in a research note. As per the report, the annual YoY growth rates for eight key production and real activity indicators have sharply recovered this year. Notwithstanding the fact that economy is still battling the effects of two consecutive failed monsoons, a global slowdown and poor private capex spending, a multitude of factors are causing the recovery, it said. "The most important reason, we believe, is that government capex is no longer being dragged down by declines in private capex," Nomura said. It further noted the potentially favourable monsoons this year and additional spend in the economy by way of pay commission awards may add to this recovery later this year. Moreover, a pick-up in private capex is likely in fiscal 2017-18 and this in turn would sustain this recovery, it said. Nomura noted it is "positive" on markets and expects a 15-25 per cent return this year, depending on the global macro backdrop. Sector-wise, the firm is overweight on financials, discretionary consumption plays (autos), IT services, oil & gas and industrials and underweight on consumer staples, pharma, metals and telecom.